Figure 1.--In a relatively few years huge changes have taken place in boys fashions. Who know what the new century will portend for the trendy boy of the 21st century. Please help us bring the Fauntleroy and other historic images to you by making a small contribution to our site. Historical clothes for boys will seem remarkable to the modern parent and boy. Only a 100 years ago the fashionably dressed American boy wore velvet suits with lace and ruffled trim. Some boys even sported long ringlet curls which a proud mother would show off to her social circle when they gathered for tea. Other mothes might cjose kiklt suits or even dresses. Comfort was not a major concern for fashion conscious mothers when out fitting their boys and girls. Today a mother does not seem to think twice about bringing her son dressed in long baggy jeans into the White House to see the First Lady! What has caused such a change in attitude in styles and attitudes? 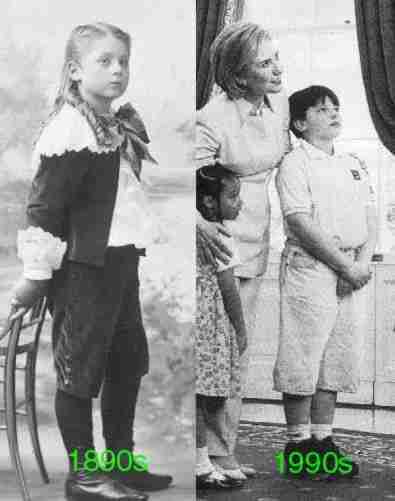 A British HBC contributor who has viewed the new Presidential site suggests that what is needed here is an image of President Benjamin Harrison or the First Lady with a boy in a Little Lord Fauntleroy suit. The comment, submitted with a touch of British irony, is not as far fetched as might be expected. While I do not yet have such an image, some may exist. In fact Mrs. Burnett (the authoress of Little Lord Fauntleroy) knew the Harrisons and her childern (who did in fact wear fancy velvet suits) often visited the White House and played there with the Harrison children. Her son Vivian was the actual prototype for Cedric Erol (Little Lord Fauntleroy). We here at HBC are collecting historical information on boys clothes in an effort to describe the many varied styles and to understand how and why fashions have changed over time, especially over the last century. Actually was we have pursued the topic we find that changes in fashion often mirror larger societal changes and thus have real historical significance. We have just begun our historical quest. It has proven to be a fascinating exercise. We have compiled a great deal of information, but in fact are just beginning our study. We look on HBC as a joint venture withour readers. It is only through your assistance and support that HBC can continue to grow. If you have any information or insights about boys' fashions and trends over time, we would be very interested in hearing from you. You will no doubt notice that HBC is not a fancy site. There is very little web razzle dazzle. We have done this on purpose to stress the content rather than fancy graphics. It also means that the pages snap up when you click on links and you do not have to contend with banners, pop-ups, and malicious software. We wanted nothing to detract from the historical images which are the real strength of our site or to lengthen already to lengthy load times. Please be sure to make a small contribution to HBC so you can see the historical images in the thousands of images boxes located on nearly every page.